Seventeen years after deadly suicide attack, Palestinian Authority has paid hundreds of thousands to the proud terrorists. 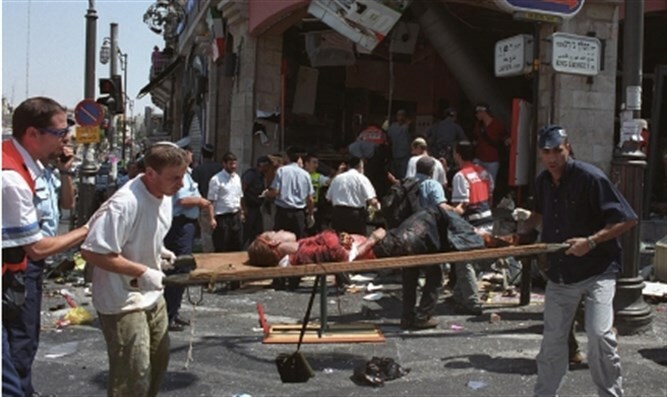 Seventeen years after a suicide terrorist detonated his explosive vest in the Sbarro pizza shop in downtown Jerusalem, the perpetrators' families continue to be rewarded with monthly payments from the Palestinian Authority (PA), the Palestinian Media Watch (PMW) reported. The Sbarro attack left 15 dead, including seven children. Three of the children were siblings, and were killed together with their parents. A total of 130 civilians were injured in the attack. So far, payments to the three terrorists total over $294,332 (1,020,570 shekels). The Sbarro terrorists are among those who the PA and Hamas insist on freeing in any peace agreement. The terrorist who made the Sbarro bomb, Abdallah Barghouti, has murdered a total of 67 people. The family of suicide terrorist Izz al-Din Al-Masri has received $50,124 as a reward for his suicide bombing. The terrorist who planned the attack and brought the bomber to Sbarro was Ahlam Tamimi. Tamimi was arrested in September 2001 and received 16 life sentences. In 2011, she was released as part of the deal to free Israeli soldier Gilad Shalit from his Hamas captors. For her time in prison she has been rewarded by the PA with salary payments of at least $52,681. The suicide belt was built by Hamas bomb- builder Abdallah Barghouti. Barghouti was arrested in May 2003, and received 67 life sentences - 15 of them for building the bomb used to murder the people in Sbarro. He has received salary payments from the PA of at least $191,526. The PA mandates that every terrorist imprisoned by Israel receive a monthly salary for the full duration of his or her time in prison and often even after his or her release. The PA also pays monthly allowances to the families of terrorist so-called "martyrs." In an interview filmed while she was still in prison, Tamimi explained her role in the attack. In the interview, she admitted that "for nine days I examined the place very carefully and chose it after seeing the large number of patrons at the Sbarro restaurant. I didn't want to blow [myself] up, I didn't want to carry out a martyrdom-seeking operation (i.e., a suicide attack)." "My mission was just to choose the place and to bring the martyrdom-seeker (i.e., the suicide bomber). [I made] the general plan of the operation, but carrying it out was entrusted to the Martyrdom-seeker. ... I told him to enter the restaurant, eat a meal, and then after 15 minutes carry out the Martyrdom-seeking operation. During the quarter of an hour I would return the same way that I had arrived. "Then I bade him farewell. He went inside, he crossed the road and went to the restaurant, and I went back the way I had come... You have to know something: a martyrdom-seeker has a very special character, and I was amazed at his great wish to carry out the operation, his great wish to pass over to a different life. How beautiful it is when you make a person - [starts the sentence again] [Suppose] there's a poor person and you give him a lot of money. He will be happy and you yourself will be happy that you realized for him the happy life that he wanted. My job was to realize, for this martyrdom-seeker, the happy life that he wanted." When asked whether she thought about the children and families in the restaurant, Tamimi said, "No." "I have no regrets, and no Palestinian prisoner regrets what he or she has done. We were defending ourselves. What are we supposed to regret? Should we regret defending ourselves? Should we regret that the Israelis killed one of us so we killed a different one of them? We have no regrets." When asked how many children were killed in the attack, Tamimi smiled and said "three." When the interviewer corrected her, she smiled again. Tamimi currently lives in Jordan. When asked by a Jordanian website if she would participate in or carry out another terror attack, she responded, "Of course. I don't regret what happened, absolutely not. ... Regret is something that is out of the question. If time could go backwards, I would carry out what I did, in the same manner." An American request to Jordan to extradite Tamimi to the US was rejected. Today she is on the FBI's Most Wanted Terrorist list.